I'm planning to make a web app that captures the user speech and tell the user if he/she is spelling the words in the right way, and gave him/her hits as to where he needs to improve his spelling. To avoid reinventing the wheel I'm looking for an open source voice recognition software. I mainly use C/C++/JS(MEAN). An example of this is Rosetta Stone, which I can't use in my web app because they don't have a public API allowing developers to use their solution. 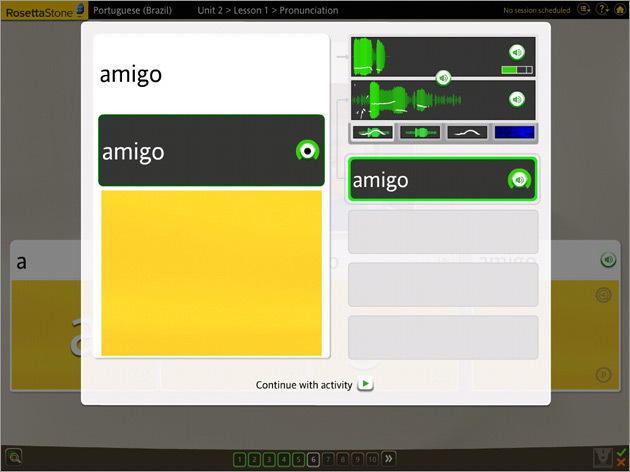 As you can see in the screenshot below, when the user says and types "amigo", Rosetta Stone will check the spelling and give a green border to it if the user pronounced correctly, otherwise the border will be in red. Basically this is what I want to do within my app. Browse other questions tagged open-source software-development speech-recognition voice-recording or ask your own question.